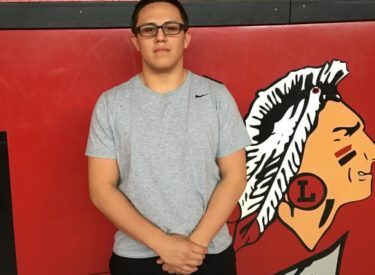 Liberal senior wrestler Elwin Trejo is the Hay Rice and Associates Athlete of the Week. Trejo won the regional for the 285 weight division Saturday in Valley Center beating his Valley Center opponent 3-2. Trejo is 29-7 on the season. He and his five state bound teammates departed for state Thursday morning. Trejo took 4th at state last year. He also plays football and competes in track and field. Interviews with all six Redskin wrestlers and head coach Kyle Molina air during the Sportsguys Friday mrong between 7:37 and 9 on 1270 and kscbnews.net.